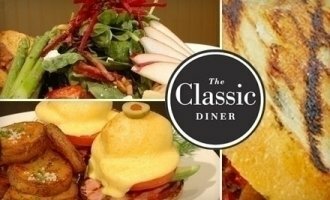 The Classic Diner menu offers well-presented traditional and non-traditional "classic diner fare" including the renowned eggs Benedict, "famous" bacon, a wide array of egg dishes, brioche french toast, and buttermilk pancakes. Favored lunch offerings include the Boston BBQ pulled pork, crab cake sandwich with chili lime aioli and custom order burgers. Open everyday 7am - 3pm.